Japan Tattoo: Where You Can NOT Go, Where Can You Go with Tattoo in Japan? You have a great tattoo on your body? Tattoo is a kind of art or self expression. But, do you know many Japanese do not like tattoo? It is because tattoo has been so popular with yakuza or gang in Japan that when one has a tattoo, people in Japan automatically associate it to the crime group. Do they always make troubles? We can not say so. As little kids we went to some public swimming pool nearby and saw one guy with a big tattoo shouting loud at other people. In the end some police officers came and escorted him to somewhere. It is often said to be also true that some gang members go to some public places and make false complaint and try to get some money out of the venue. But it is not always that the yakuza makes trouble ( or not?!). We also saw in some public bath some guys with big tattoo played with their kids. Is it sad if the kids of the gang group members can not play with their parents just because the parents have tattoo? Where you most likely can not go with your tattoo in Japan? A basic rule is anywhere "public" and where you become fully or partially naked. You can go with your tattoo to basically anywhere "private". Many may wonder..." there are many super stars out of Japan full of tattoos such as Johnny Depp. Where can he take a hot spring bath with his full body tattoo?". The probable only solution is to have a private one or rent a venue exclusively! A private hot spring of your hotel room. The swimming pool you fully rent. 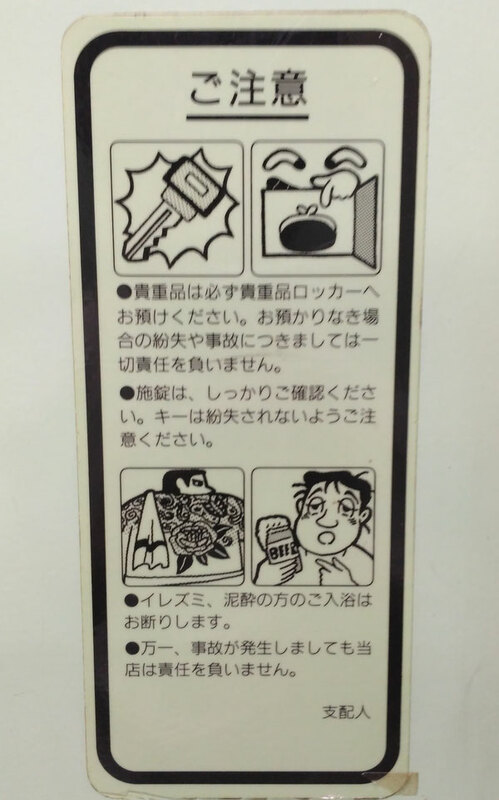 For a public place such as swimming pool, sauna, hot spring, public bath, the venue tries to keep away the crime group by putting a sign saying "crime group people not allowed". The venue is reasonably supposed not to care about those who are not crime group member even with tattoo. From our observation, in case the crime member denies that they are crime members. It gives the venue an easy reason to kick those away by saying "anyone with tattoo not allowed!". So for us, the No Tattoo statement is rather strategical and practical to keep the venue out of the gang member. Well, if you have this big tattoo, it may be hard under the new rule too.. Source: Wikipedia. New Tattoo Rule in Japan "Finally"
As of july, 2018, not too many public bath/swimming pools accept people with tattoo (Check this Tattoo ok bath/swimming place list for Japan ). But something seemed to start changing (a bit). 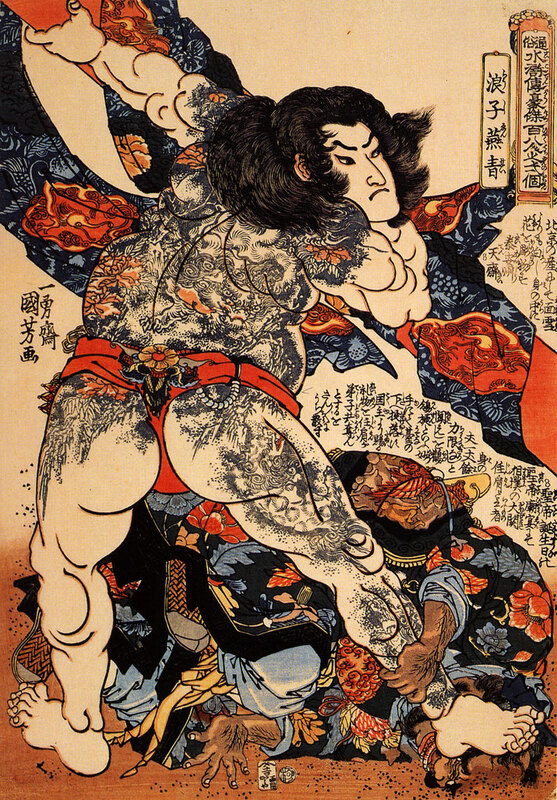 For Japanese, it is because tattoo is often associated with Japanese mafia. You may see a lot what we mean in the movies of Ken Takakura and Bunta Sugawara. Many public baths and swimming pools ban those with tattoo from entering them. The prohibition even extends to tattoo stickers. There was an outcry in Japan, when one indigenous person( an Maori person from NZ) was not allowed to take a public bath in Hokkaido because of her tattoo in 2013. This may be because the venue thought it would not stop someone with tattoo who claims that they are from the indigenous background in the future. Tattoo concealer looks like the above. With increasing number of tourists from overseas, some public baths trying to change the rules as they understand that tattoo(esp. of those of foreigners) does not always mean mafia, rather mere fashion. For example, this public bath in Saitama near Tokyo announced to run one month trial(from 1st of August, 2015 till the end of August, 2015) where it allows those with the tattoo cover-able/hide-able by their sticker 12.8cm x 18.2cm to enter. You can not bring your own sticker, the bath operator provides its own official sticker. If the trial goes "smooth", it will officialize the rule. And this famous hotel resort operator Hoshino resort also starts the similar rule from October, 2015. This hotel's sticker is 8cm x 10cm. The size of sticker is different from one another but you can somewhat expect from 8cm x 10cm. You can cut some paper in this size and put it over your tattoo. If completely covered, you can enter at least the above public bath in Saitama and also the hotels of Hoshino resort. It seems some more public bath/hotel/ryokan operators follow this new rule. But still it is expected that the change will not be fast. 1) find a place with a private bath. Many hotels/ryokan(Japanese inns)/minshuku( guest houses) have private bath tubs attached to the room where nobody other than you( and your family etc.) can access. Even some public bath( not hotel) have the private rooms equipped with baths ( for which you need to pay extra). This is usually an expensive option. 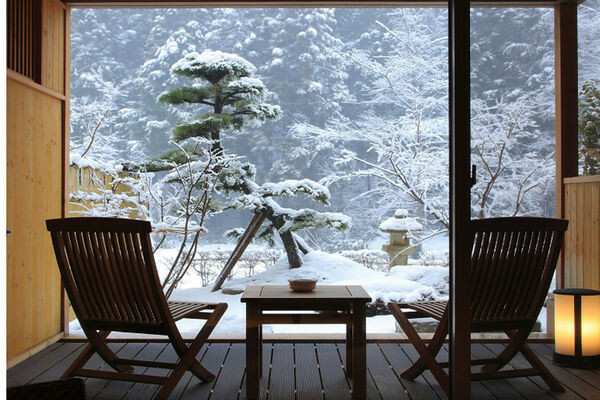 Note: Many minshuku( guest houses which are reasonably priced) tend to be small and are with no private baths. 2) find a place with a bath which you can keep for yourself( and your family etc.). We came across some hotels/ryokans/minshukus where you can keep the bath room for yourself for some time. The system works like this. For this type of bath, you see a plate hanging on the door of or around the bath saying "occupied" on one side and the other side "available". This is usually not as expensive as 1). 3) find a public bath/swimming pool/sport gym which are "said by its users" to accept people with tattoos on this website Kimono Rocket TATTOO Ok list. On this website people post the place which can accept tattoo bearers and reviews. NOTE: Onegai Kaeru team is not convinced by the accuracy of this info in general. We visited several places and saw the signs "No tattoo". 4) find a place from the Tokyo Sento(public bath) Association list. This association, consisting of the public bath operators in Tokyo area, announced to allow people with tattoo being in their places. Their website has the easy instruction how to take public bath in Japan basis of which you can apply to all baths in Japan. (Unless your tattoo are one of these wearables as we suggested! ) either, you take any option 1), 2) or 3), you must send email or call up the place and explicitly ask if okay to come with tattoo. The example of sentence you can say is "Konnichiwa, Sochira ha Tatuu( Irezumi) Ookey desuka(Hello, with Tattoo, Okay there) ? 今日は、そちらは刺青大丈夫ですか"
Note: There are always a lot of ambiguity with Japanese expression, better say these in English and get the clear okay, or let a Japanese speaking person ask. If the answer is positive, always remember to keep the name of the person on the other end of the line just in case. We have the list for those who wants to enjoy taking public bath/swimming pool etc. Check this Tattoo ok/friendly bath/swimming place list for Japan (and you can list if you find one for others with tattoo who want to enjoy public bath in Japan). Again there is no guarantee that you can get in. Even if you call up one of these places from the list, the staff may say "NO" as "an official response" even where you can in fact. Travel Destination tips for Japan: Latest and biggest list of interesting islands in Japan to explore!